we are a mass of contradictions when it comes to our beloved sport. intent on savouring every televised minute of the spring classics; more than a month's worth of scrabbling across the former battlefields of central europe, there but for the grace of a professional contract go we. while i have spouted forth upon the rapid deterioration of islay's roads, i am well aware that the same fate has befallen many a trammeled highway, the length and breadth of the country. though a devastated country such as japan can seemingly present its destitute residents with a smoothness of highway the like of which we have rarely seen, our bankrupt economy seems helpless to prevent the curtailment of smooth transport within its coasts. along islay's southern coast are three distilleries, amongst the most prominent of their genre in the world, and all accessible along a three mile stretch of road; laphroaig, lagavulin and ardbeg. the roadway just past the entrance to the first named has long provided anguish for the roads department in that the port ellen bound lane continually subsides, and it has now been deemed too expensive to repair. therefore there is in motion a proposition to reduce the road to a single-track between laphroaig and lagavulin village. though the pelotonese rarely venture that far south during the winter and spring months, the remaining highways (a euphemism, you understand) are in just as sorry a state, making what used to be milan-sanremo into the hell of the north. yet i bemoan this fact; where is my spirit of adventure? am i not guilty of joining with the massed couch potatoes of the world in crying 'foul' when any member of the professional peloton even hint at the possibility of escaping the cobbles for a smoother progression along the edge of road? fans, however, regularly invoke the unwritten law of fickleness. in my time, having only ever crossed a short passage of remarkably tidy paris roubaix cobbles, i was wont to search the horizon for a nearby mechanic, for i feared a broken steerer or speedily dismantling headset such was the vibration. i realise it is our birthright to be the arbiters of endeavour on behalf of others, but it worries that this is perhaps an enfer too far. it is the inspiration of those huge lumps of stone that lead to our collective enthusiasm; a desperation to imitate those of the musette and imagine ourselves merely a hop, skip and a jump ahead of a raging peloton as each successive cattle grid is traversed, though while the pros do so in short sleeves and bib shorts, we are likely softer to the touch with flemish flavoured bib three-quarters and close fitting roubaix armwarmers. the latter are a misunderstood and underestimated pair of accoutrements, allowing for a rolling towards the elbows or wrists if hardness is demanded. the badge of honour is justly rewarded if said garments are in a reddish hue that cannot be ignored, trimmed with the excellent graphic output of mr coyle of perren street. 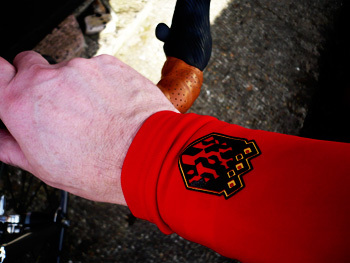 one of the first results of the collaboration between rapha and the amaury sports organisation, these red armwarmers are a graphic and thermal accompaniment to the paris-roubaix challenge jersey. made in italy, they have restored the small but ultimately necessary tab to assist removal (these tabs were/are missing from the armwarmers accompanying the classic jersey). thus having pulled these close fitting tubes of arm cossetting fabric to cover wrist to shoulder, removing same before stumbling into a hot shower is but mere bagatelle. summertime it may be, but sun, sea and blue sky do not a summer make. ninetyfive kilometres of rattling myself into a myriad of constituent particles, at several kph slower than the colnago i was riding, only just conferred a degree of warmth that all but disappeared below warp speed. those armwarmers bore comfortably as much go as show, and i can see little harm in advertising their cobbled affiliation as i moan about the moonlike surface of islay's roads. i have just discovered that there are copies of chris milliman's drink smoke flanders available in the uk from richard at urban hunter. so if it seems silly to contact myles in portland, use the link below to order a copy using the good old british postal service. though members of the peleton did forget to set their clocks forward by one hour at some unheard of time in the early morning, we are now in british summertime. the most visible evidence of such is the arrival of the sunday newspapers at lunchtime, now that there's a boat leaving kennacraig mid-morning (it's an island thing; mainlanders need not apply). 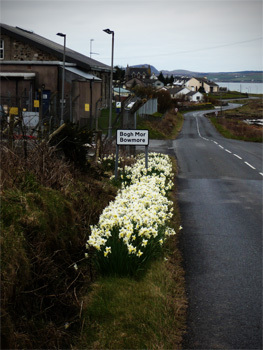 that and the fact that the roadsides are thick with narrow carpets of daffodils. the word summer provides all sorts of connotations, but principally that of blue skies and a glowing orb across the sky, and i will readily admit that, at the time of writing, apart from a few clouds dotted here and there, the view from the sitting room window would confirm the hypothetical scenario. unfortunately, that orb is ninety three million miles away, and the heat i am led to believe radiates from its circumference, seems to have given up the ghost at around ninety two million. in short, it's ruddy freezing. however, with the exception of the mighty dave t and his millions that have afforded him a summer house, the remainder of the pelotonese are sufficiently cossetted that homes are awash with sufficient heat and hot water to render life as comfortable as it needs to be. and though this island has its moments of high winds, raging seas and horizontal rain, none are what could be considered life threatening. not so for those in japan; many bereft of family members, employment, heat and light, and in far too many cases their entire homesteads and transport. 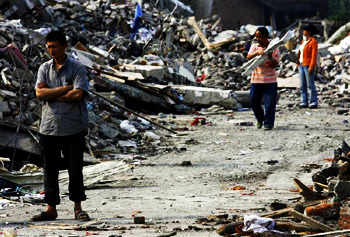 i, along with many, cannot begin to comprehend how those people are surviving and how they intend to rebuild their lives in the future. and more frighteningly, the fukushima power station is leaking radioactivity at a level that is hardly encouraging for the immediate and long-term future. japan figures highly in islay's past, present and future. morrison bowmore distillers are wholly owned by suntory, and the streets of islay are often peppered with japanese whisky lovers who arrive at the most unlikely times of the year in an endless quest to visit the source of the amber nectar. while i very rarely come into contact with any of them, aside from the occasional 'hello' at some bizarre time on a saturday morning, and we have yet to have any japanese join us on the sunday ride, if i used capital letters, sympathy would be writ large with a capital 's'. with rapha having created the wide-ranging rides for tohoku the opportunity to benefit such a dignified people in their major time of need by riding a bicycle seemed a particularly appropriate action to take. the one problem, and for us it's quite a large one, is to find any rides close enough in which to participate; there's a large body of water surrounding islay that would render it more expensive to join a ride for tohoku than would be gained by any donations we could provide. 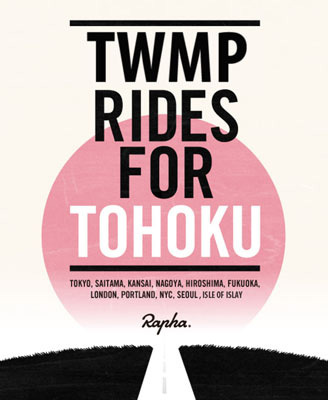 never a peloton to lose out, we decided to organise and hold our own twmp ride for tohoku. our peloton is miniscule by international (and local) standards, not abetted by one having to work and miss out on the echelon. however, an article and advert in the local paper alerted enough to our ploy, adding one to the peloton for at least a portion of the ride, and several unprompted donations from those unable to take part. the ride itself was over one of the favoured routes, shaken and seriously stirred across a network of potholes masquerading as country roads. but in the light of the japanese plight, we were more than happy to take that as another facet of character building. this is not a competition, nor is it an impassioned plea for recognition and one-upmanship; it's about raising money for some seriously disenfranchised human beings in a country that has had a disproportionate and welcome influence on the world of cycling. we raised £150 over the course of riding about 70km, and it has been pledged through rapha's website to aid the japanese red cross in their quest to provide care for those who so desperately need it. it wasn't hard to do; anyone could manage the same. so if there's not a rapha ride near you, take the advice of nike and just do it. i still make websites; and i still make them in what i regard is a rather archaic way. yes, i understand cascading style sheets (a very elaborate name for a somewhat mundane and logical process), but i haven't a clue what html5 is, and the best i can manage with sql is tell you what it's an acronym for (structured query language since you ask). so while i sort of understand the principles of those clever sites that allow the user to reconcile the russians and the chinese, i haven't the notion or inclination to try and achieve it for myself. or, for that matter, anyone who is daft enough to ask. the end product of my efforts can best be described as brochureware. heck, even the post relies on frames which i believe went out with the dinosaurs. the best i have going for me is a yellow background and the fact that it's all put together on a mac. my technical background is in pre-press; the obscure black art of trapping, line screens, angles and cmyk, the very language that needs to be spoken by the printed word, but it will surprise very few that print has hurdles all of its own, mostly related to cost, cost and distribution. for while i pay an annual fee to my webhost, these persistent daily articles telling you all the stuff you really didn't need to know, only involve amounts of time and finger effort. and the utterly fabulous part of weblogging is that it is infinitely updateable in real-time and has no restrictions on space. when tendering my article for rouleur last year, i was given a target of a certain number of words. had this been intended for the post, you'd still be reading it now. but in the latter part of the nineteen nineties, we were all agog with this new thing, the interweb; we were tired with print. it was so yesterday's thing; give me pixels by the truckload. what else would the self-respecting crust earner with pre-eminence in paper and ink do to stay afloat? but now we're sort of tired with pixels. not completely you understand, but it's no longer the newest game in town, and that print thing looks pretty darned cool. which is, of course, absolutely correct, but it's no longer print as we knew it; it's 21st century print, the forerunner of which is undoubtedly rouleur which begat (well, not really) embrocation which was almost bypassed, resulting in boneshaker, a sort of compact and bijou version of rouleur but nothing like it (i know you know what i mean). this leap of faith by so many to take a well aimed pop at the mainstream cycle press, much of which is still entrenched in the 20th century, deserves, and receives my admiration. i only wish i were so forward in my intentions and thinking. and just when i thought it safe to re-enter the water, i came across a bi-annual publication from new york city of which the second edition has cleared the press only recently. now aside from berating myself for not having picked up on the fact that there was a first edition, i have acquired a copy of number two. 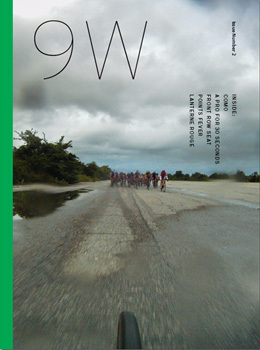 9w is another compact and bijou magazine trumpeted on its website as a journal of cycling photography, and i am happy here to give the impression that the post has a thematic thread running through it, having exposed my readership to the skills of chris milliman only yesterday. unfortunately, i'm not that organised or clever and must invoke the law of coincidence. 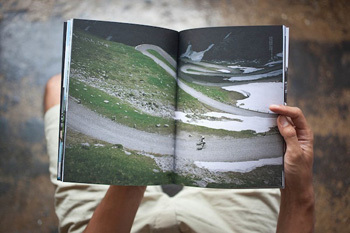 what has always been the biggest surprise and delight to me, one verging on obsession with cycling photography in all its many incarnations, is that these contemporary publications are wholly complementary, overlapping to an almost insignificant degree. 9w, should you be wondering (i sure as heck was) is named after the so-called escape route from new york city. this sixty-two page a4 publication contains some fabulous photography definitely not in the style of graham watson. the imagery is enhanced by the printed word, but it definitely takes a close second place to the photography. the fabulousness of issue two is that none of the photographers, so far as i know, are amongst the usual suspects. it never ceases to astound how many lensmen have concentrated their shutter speeds on the spinning bicycle wheel and its attendant population and scenery. the cost is a mind-numbingly reasonable $15 (plus postage to wherever in the world you live). the beauty is that the words and pictures will last a luxurious six months, before luxury again intervenes. take a look at the average international cyclo-cross race, and break it down into its constituent parts. as with many things in life, the whole is often greater than the sum of its parts, coalescing in a form those of us with words can easily describe as atmosphere. each region is going to have features not experienced in others, but that's often what makes a nation; how it treats its cyclocross. commonly experienced characteristics are miles and miles of course tape, the wording often folded over to protect the sponsor; advertising hoardings often proclaiming obscure products or services; mud, and either thousands of fans hanging over the race line with percussion ranging from a drumset (honestly), to the more humble and portable cowbell; or one man and his rainjacket. in belgium, holland and portland, the noise is likely a tangible force; britain ladles the same in more sparing quantities. if you have entered as a competitor, an event takes on a different hue than that of the spectator. if you're a member of someone's pit crew, the race is likely but a fleeting glance, interspersed with pressure washers, or a trip to a strategically placed, nearby stream. but the constituent that pretty much makes a race, whether off or on road, is a liberal smattering of spectators, preferably lined at least three-deep along the start/finish straight. the above is all observation, and subjective observation at that, for it is inarguable that i will probably not see what you see, or indeed, that chap with the panasonic cap standing by the tree at the second bend. rumour has it he used to be pretty good in his day. so, if that's what we accept as the bubble in which a cyclocross race exists, what could i have possibly missed? having fed a sorry face at the green dragon in portland with belgian frites and mayo, i can only assume that north america's idolatry of the european 'cross scene is replete with such scoff. suitably fried potato sticks and mayonnaise are as much a part of the central european game as mud, sand and cowbells. and we should never forget beer and the disgustingly unhealthy smoking habit that always seems totally at odds with the athletic endeavour being played out between endless lengths of tape. remove one of these intrinsic aspects of cyclocross and the whole house of cards becomes structurally unsound; but honestly, who is ever going to be that insolent? observations are more focused with hindsight; when all is over and done with, there is as much time as required to reflect on whether the day was enjoyable, whether it was cold and wet, whether one may have partaken of just a few too many frites, and now engaged in supping one too many pints. not exactly the most scientific method of recollection. but could any of us - and be honest here - record all the above in the twinkling of a shutter eye? but take heart from my descriptive prose, for the cyclocross season is over and done with for season 2010/2011 and i have had the benefit of chris milliman's drink, smoke, flanders as my aide memoire. issued as a numbered edition of ninety, this 26 page book demonstrates why the minority are photographers and the rest of us simply own cameras. 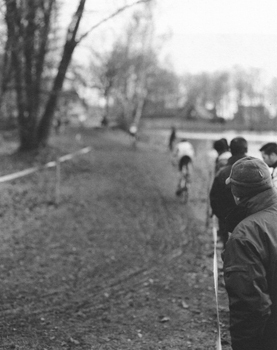 chris milliman's colour and monochrome photographs of cyclocross in flanders manage, almost unassumingly, to depict aspects of an event that would have passed most of us by. and thus, with a skill of which i wish i owned even half, he has brought the whole picture to life. this would be a superficial victory on his behalf if it were simply a case of appreciating milliman's technical art, much like there are those who marvel at the ability of painters to record images all but photographically. paying homage to technical skill will always misunderstand the imagery formed as a result. 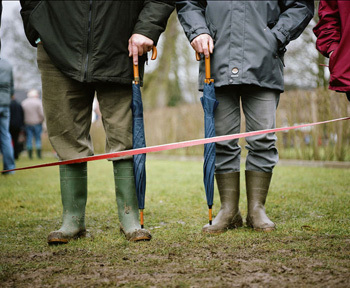 however, chris milliman has rendered his photographic skill ultimately transparent. at the risk of being thought pretentious, viewing this slim volume obviates the obvious; that this is a book of photographs. the opening image is of two pairs of wellingtoned feet belonging to suitably attired spectators; the left hand of one matches the right of his neighbour. both are clutching umbrellas parallel to their stance. the image is bisected by red course tape. the image cuts off just below chest height. in the model of correct photography, this would be regarded as one that should have been thrown in the trash. 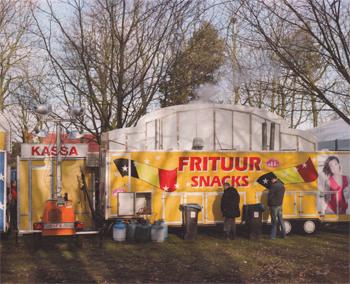 many of the book's accompanying images feature the inscrutable faces of cyclocross spectating, along with acute observations of the paraphernalia and ephemera that constitute a flandrian 'cross event. 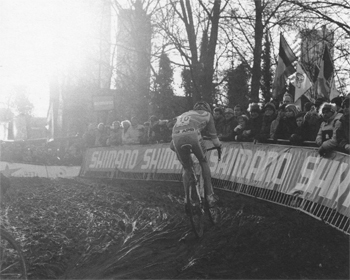 i'm almost tempted to use the cliched phrase 'it's cyclocross jim, but not as we know it'. i spent three days (well, two and a half and a bit if you deduct the time taken to eat some toast) recently partaking of some video editing. i'm not stunningly good at it, though i'd like to think i can manage a degree of competence, but it puts those sort of things into perspective by relating the time taken to edit, against the number of minutes the final footage contained. and just to whet your appetite or sense of curiousity, it was for one of islay's distilleries. now lest i give the impression that my skills are greater than they actually are, none of the filming was done by me; my job is simply to take the stills and moving pictures, pop them into final cut and stitch everything together. i leave the cinematography to the experts. in this case, the expert spent several days popping back and forward to the distillery to grab footage, depending on the weather. in this case, he likely spent more time on this project than i did. and for all our efforts, the resulting video lasts just under twelve minutes. it is this disproportionate amount of time spent that makes film-making such an expensive and time-consuming business. movies such as those in the harry potter franchise cost several million to make, months, if not years to film, and more months and weeks to edit. granted, they tend to receive even more millions at the box office, something that undoubtedly makes all the drudgery and repetitive strain injury all worthwhile. but what of films that don't feature harry potter? 2008's masterlink films release, the road to roubaix was a cycling movie in the tradition of a sunday in hell, stars and water carriers, and robert millar's the high life. not just a glossy overview of paris-roubaix with lots of sponsor's logos, but an in depth and scrutineering tribute to the race and stuey o'grady's win in the roubaix velodrome. a film with a specially composed soundtrack which subsequently did very nicely thanks in the itunes and amazon download market, a movie that truly deserved a follow-up. if the world worked through the auspices of simplicity, film-makers david cooper and david deal at masterlink would simply load up the car with lenses and film, and head off into the sunrise ahead of the peloton. simultaneously, paul o'brien would fire up logic on the mac, plug in a keyboard, and we're already on the way to cycling movie number two. back in the real world, that's sort of what is happening; project number two is entitled champion and currently in pre-production. the subject matter is, perhaps unsurprisingly 'champions' featuring exclusive, first-person interviews with the 20 greatest living cyclists from around the globe, designed to explore the sports' most compelling qualities. starting any new project is always fraught with excitement and anticipation, but it must also be somewhat of a daunting prospect. what makes it worthwhile? masterlink's david cooper; "When we finished editing and released Road to Roubaix, I couldn't imagine shooting another film. I was wiped, and so glad to be done. It's hard to put into words. Perhaps the reason we're making Champion is because we feel compelled to. This film-making thing is not logical - it's a compulsion! "So yes, it's daunting, but if I could only give one reason we're making this film, it's because people were so kind about the first one, and the cycling community is just amazing. They live, eat and breathe cycling. And they want to see high-quality films on the sport they love." david deal while agreeing with cooper's sentiment, provides an additional view, given the differing track that champion is likely to encompass. "From a professional standpoint, we get to do something different. There are new contacts to be made, new locations to scout, and a new script on which to work. Personally, we are all looking forward to meeting the interviewees and to hear what they say." 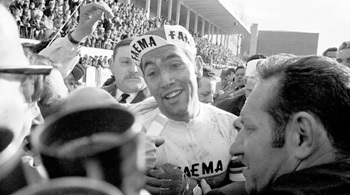 part of the success of 'road to roubaix' was the innocence with which it was approached and portrayed. the viewer was often treated to the impression that they too were experiencing the race through fresh eyes, uncovering its secrets, surprises and excitement along with the riders and davids deal and cooper. i cannot deny that paul o'brien's soundtrack contributed greatly to this, providing a whole that was greater than the sum of its parts. 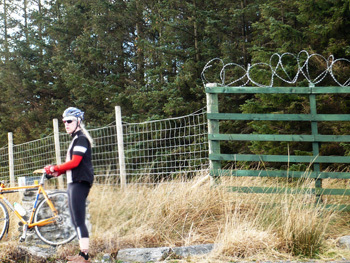 the endearing sense of naivety marked the film out from many a contemporary cycling movie. were they, therefore, approaching champion from a position of knowledge about their intended subjects, or was the movie a quest to find out more? david cooper; "For me, Champion is a quest to find out more. I'm fascinated by sportsmen like the gentlemen we'll feature in Champion. There's so much nuance to what makes them who they are. And frankly, the short snippets you see before, during and after the races' broadcasts just don't tell you anything. I want to give the audience an opportunity to hear from these champions, what qualities they think mattered in their life that made them who they are." david deal confesses that his heroes were sean kelly, bernard hinault and greg lemond. "I read all I could about those guys. But the purpose of Champion is to provide a vehicle for these athletes to open up about all the smaller aspects of their lives, both directly related to he sport and others a bit more removed. We are interested in hearing them talk about all the other things that contributed to their success." masterlink films is one of the new kids on the block, their sole offering to date being the above mentioned road to roubaix, and here their second outing is about to concern itself with the same sport but different aspect. is this because cycling lends itself to the motion camera lens? david cooper thinks it does, but also figures pretty much everything in life does; "Primarily I think of myself as a still photographer, so I often view the world through one lens or another. But for Champion, our focus is on my very favorite subject to film and photograph; people. These champions have stories to tell, and we want to hear it from them directly. The film will be a series of intimate stories and discussions that move an audience that already idolises these men. And there's definitely poetry in that." for david deal it's almost the other side of the coin. as he says, interviews are interviews, but thinks filming a race to be a very satisfying experience. 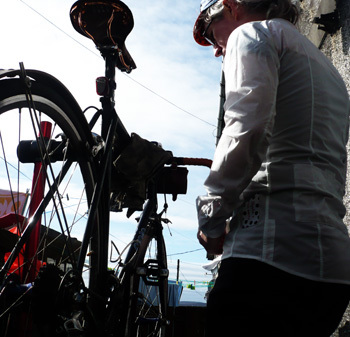 "From a distance, there is a poetry to the collective movement of a group of cyclists. From the vantage point of a spectator on the side of the road, there is an immediate connection that is very physical. The noise, the sounds. It all can be thrilling to film." but bearing in mind david bowie's album title, it is hard to accept vision nowadays without sound. as david deal explained, with paul o'brien's soundtrack to roubaix "it was like we were cheating. It transformed our part of the film into something we had never envisioned." 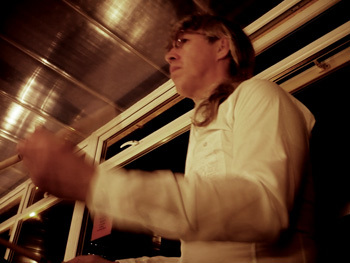 so entranced were both with the difference o'brien's music made to their first film, that his services have once again been engaged to compose the soundtrack for champion. in which case, is paul provided with any conceptual ideas from either of the two film-makers? "Yes, they have an idea of what they want. Both having creative backgrounds, they see the bigger picture. At times, they would often trust me to go with my gut instinct, which is when I think I produce the best material. The Road to Roubaix theme song (or the music intended for the trailer) ended up being very different from their original idea, but looking back I can't imagine it being anything else." while those behind the camera have their storyboards and mental images of where they see the imagery heading, the composer may not be party to the same visual stimulation, or may, indeed, hold an entirely different perspective on proceedings. does o'brien have any compositional ideas prior to the arrival of a rough edit of the movie? " I do and I don't. With Road to Roubaix, the idea of using strings came from nowhere. 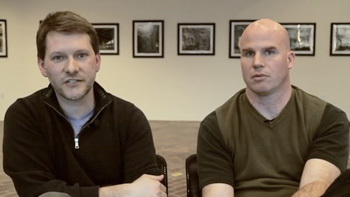 Dave Cooper and David Deal had the idea of using the soundtrack to the film Baraka something to refer to. When I was trying to come up with something for the trailer, it just wasn't working. Due to my lack of resources to create that sound, and due to it not matching the imagery. If something doesn't work the first time, I will usually trash it. The footage of the of riders in their down time, the expressions on their faces etc gave me what I needed to write Heroes and the more somber pieces." in which case, how hard is it to have a piece of music match the action for which it is intended? "With Road to Roubaix, the editing and writing process worked both ways so for me, I could be a lot more loose with the writing. I would write to rough footage, and the footage was edited to the music. I think this way of working is a lot better than the traditional way of writing to the exact frame in a film. Music is such an integral part in film that it seems strange that it doesn't always happen like that." however, much of the foregoing is leaning towards the academic side of the experience. the artistic and theoretical side of pretty much any project can lead to hours of enlightening and cheerful discourse. plans for anything can reach just short of the ceiling as long as nothing has to be set in concrete, or as long as a price has not been placed on its head. aha, money; things were bound to come round to that old chestnut sooner or later. for while a harry potter movie might cost untold squillions, it's a sound investment based on past financial returns, so garnering money upfront is not hard to do. though road to roubaix was successful on its own terms, messrs deal, cooper and o'brien are unlikely to be buying condos in beverley hills anytime soon. funding for worthwhile yet barely economic projects such as 'champion' is hard to come by. but while still in pre-production, masterlink chose to post details of their latest project on kickstarter, a website on which artists can ask the great unwashed to donate varying amounts, according to their means, in an effort to fund the amount required. in the case of champion, masterlink are looking for $135,000, which i'll admit seems a perfectly achievable amount, particularly since the closing date is friday, may 6; 43 days away. why did they choose to flag up the movie on kickstarter? david cooper; "It is very hard to find funding, but to be honest this was more about being inspired by the people that support projects on Kickstarter. These people who support Kickstarter projects by pledging their hard-earned money are doing so for a simple reason: they have faith in the arts. "That is inspiring and it's the way I feel too. I became aware of Kickstarter only two months ago or so. Once I saw it I realized the site has harnessed something really powerful and amazing on behalf of creative people, I decided Masterlink Pictures should try our luck there, and so here we are! "In a time when the global economy is struggling, and arts are being cut from school budgets in the states, and people have been spending less, Kickstarter and other sites like it are keeping art and artists from fading." david deal feels that, now they own bit of perspective having released road to roubaix over two years ago, they've realised how hard it is to make and sell a cycling documentary. "The cycling community is extremely loyal and we have benefited from that very much, but there are certain realities. The average non-cyclist does not follow the sport. In the U.S., cycling is reduced to the Tour de France. It is difficult to get people interested in investing in a movie that has a subject matter such as ours.". assuming all goes to plan, and the funding is in place, when would they hope to have champion reach the silver screen? says david cooper "We plan to release the film in 2012. Probably Summer 2012. It all depends on funding, so we really need our base to support our Kickstarter project." really good films about cycling are hard to come by; likely the very reason why many of those mentioned at the opening of my article such as stars and watercarriers and a sunday in hell are described as iconic. if we want to add to this minimalistic panoply, it seems only right and proper that we dig into one of those three back pockets on the race jersey and put our money where our dvd player is. you can pledge as little as $10 or as much as $7,500; each amount carries accrued benefits, but surely the greatest is having made some sort of contribution to the depiction of the sport we are all fanatical about? i've already made the pledge. who's next? it's monday 11th of july 1983. as is common in france at this time of year, the weather is particularly sunny, the tour de france has been underway for nine stages and now the riders are en-route from pau to luchon in the french pyrenees. as we join the action, scotland's robert millar is sitting in the slipstream - what there is of it on such a steep gradient - of number 125, patrocinio jimenez, riding for cafe de colombia. it is millar's first tour and the two riders are sitting comfortably ahead of a chasing pedro delgado. 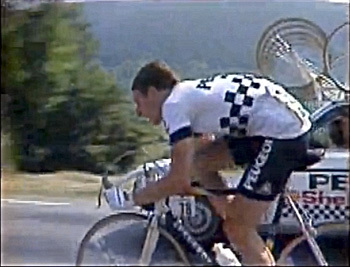 there are only 15km left to the finish line, and as they close on the summit of the peyresourde, millar decides it is time to stop shadowing and get on with the job in hand. the last thing jimenez would have seen as he struggled up the mountain, was millar's number 38 disappearing up the road at an alarming rate; he was unable to even consider chasing. millar crosses the king of the mountains line well ahead of the colombian, having created a huge gap in a very short distance. in order to take the first stage win by a scotsman in the tour, he'd have to keep up a 68kph average over those last kilometres, aided, it must be said, by a hefty and speedy descent off the mountain. the peugeot team car, with berland at the wheel, pulls alongside shouting loud encouragement. millar's face is a picture of torture, one which remains up until those last few metres in luchon when he knows the victory is his. this is 1983, so helmets are un-thought of, and to watch the diminutive scotsman sit up in the saddle, peugeot cap in place, jersey zipped up, throw both arms aloft and freewheel across the line is one that not only will robert likely remember forever, but thousands of cycling obsessed scots who didn't believe one of their own could be so devastating at this level. as millar rolled across the finish, there was just time to see the flashes of red and yellow on the sleeves on the now iconic black and white peugeot jersey, before delgado hove into view just ahead of his following car. millar's victory was taken six seconds ahead of the chasing spaniard and a full one minute thirteen seconds ahead of yellow jersey wearer, pascal simon. the despondent jimenez, unceremoniously left at the peak of the peyresourde, finished a further 17 seconds back. eventual winner of the '83 tour, the late laurent fignon, was adrift by four minutes, twenty three seconds. 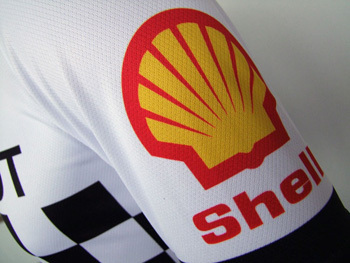 why on earth a petroleum company would wish to sponsor a cycle team is open to conjecture, but in doing so, shell were following in the footsteps of bp. 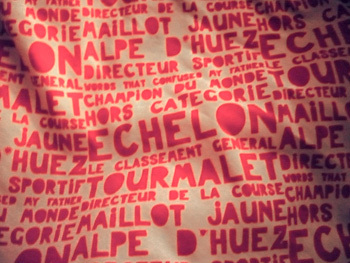 their green and yellow logo had decorated the sleeves of peugeot jerseys in the time of tom simpson. if you've watched any professional racing on the tv, particularly the shots from the helicopter, you cannot fail to have seen the huge motorised convoy following a few blokes on bikes. so maybe that was it; maybe both shell and bp looked upon cycle racing as more to do with motoring than cycling. will we ever know? but what of robert millar and those of us who still want to celebrate an incredible career. it's very difficult to watch any footage of millar in victorious mode without wanting to advertise hero worship, national affinity, or both at the same time. t-shirts with richard mitchelson's excellent caricature of the man is certainly one option, but if it's necessary to go one stage further and mix with the peletonese, a jersey is a necessity. one with three back pockets. 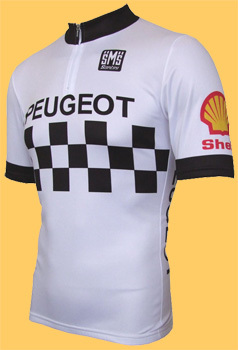 up till now, that was pretty much a non-event, for the peugeot jersey available from prendas sported only those bp logos. that, however, is all about to change, and very soon. from the house of santini in italy, the very replica of a peugeot/shell jersey that we have all waited years and years for, will be arriving in may, and available from a prendas website near you. this short sleeve jersey will be available in sizes from extra-small to 6xl. price yet to be advised, but the timing is ideal for that much vaunted 'warmer weather'. it has never failed to hold my interest that certain inventions for one specific purpose end up being used in ways possibly not even in existence at the time of the original discovery. the first successful test of an incandescent light bulb took place on october 22 1879, an invention credited to thomas edison, but effectively a refinement of developments that had been taking place over the previous threequarters of a century. after experimenting with platiunum and other metallic filaments, edison changed tack and ventured along the road of using carbon. however, you'd have been hard pressed to use edison's carbon to construct anything that looked like a bicycle, had bicycle design of the time been settled on to any great degree. edison's carbon fibres were of more fundamental nature than the stuff employed by mclaren's formula one chappies; cotton or bamboo to be precise. these were carbonised by baking the filaments at high temperatures, using a method known as pyrolysis. strangley, the resulting carbonised bamboo filaments were fire-resistant and able to endure the intense heat required for incandescence. carbon fibre has changed dramatically since the late nineteenth century, particularly with the discovery of high tensile strength carbon fibres in the 1950s. rayon was the initial option but subsequently replaced by more effective materials such as polyacrylonitrile. so had it not been for thomas edison building upon the developments of others, we might never have reached the stage where a big bicycle company coalesced with a formula one race car company to produce the bike that won 2011's milan-sanremo, and it is more than fitting that my rudimentary introduction to the world of carbon fibre has remained bicycle related, for that is what we are all about. rapha first introduced the stowaway jacket a good few years ago, a jacket that could repel vast quantities of precipitation but struggled a bit in the breathable department, and was subsumed by a jacket made of a windproof and showerproof fabric that was thinner than most brands of toilet paper. stowaway is a term that has given way to the perhaps more aptly named windjacket; still water resistant and a grand adjunct to the rapha rainjacket. but it's a jacket, the sort of garment that can be unceremoniously scrunched and stuffed in one of three back pockets. it has to work for its money, and it's unlikely to be cossetted and pampered in daily use. the fabric was either developed or created with the sole purpose of sheltering that honed physique from those ever-critical elements, hellbent on making cycling life less than comfortable. but you'd never make a shirt out of it. the rapha + paul smith windproof shirt is indeed made from the very same fabric as rapha's windjacket, yet if their website didn't tell you that, it would likely remain a well-kept secret. the very first thing you should always do with a very nice, stylish garment such as the windshirt, is test its sartorial import by wearing it to a gig. for though the wind is less than noticeable at a local islay hostelry of a saturday eve, presentation is everything. and taking the shirt far away from its comfort zone by forcing it to sit behind a drumkit for nigh on four hours is as great a test as i have been able to devise. that i was ultimately successful was confrimed two days later when an attendee at said music making remarked on how stylish i had looked behind that drum workshop snare drum. 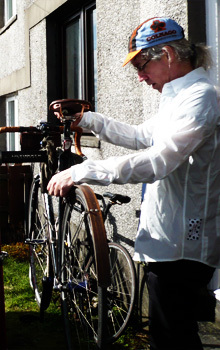 well, not exactly, because pretty much any decent shirt would confer the same fortune upon my usual designer scruff, this is supposed to be an unashamed cycling shirt, with all the connotations that implies; its cleverness is well concealed and far too subtle for any drum stool. for though outwardly it may confer the appearance of a mild-mannered reporter, behind those concealed front buttons is a zip. this is a shirt that can be thrown on atop a t-shirt or baselayer, ridden with a devil-may-care attitude, immediately converting any eleven speed racer into a fixed wheel cool dude. as you close inevitably on that hebridean coast with its ever present wind, the front of the shirt can be quickly zipped before final buttoning against the encroaching elements. if all ended there, the price of admission would have been justified, but in those echoing words of comedian jiminy cricket, "there's more." the collar buttons down each side, hiding a flap that can be buttoned across the front to protect the neck. that very same collar also features a button at the back of the neck, allowing flip-up and revealing a fluorescent pink tab to aid visbility. the long-sleeves are of commendable length, though i did find it a bit of a struggle to get hands in and out past the cuffs without unbuttoning. ideal in the sense of wind repelling, but a bit of a faff for a cyclist intent on getting on the bike as quickly as possible. those cuffs can also be flipped to show more of the bright pink. along with a buttoned front chest pocket, there are two remarkably subtle rear pockets of a size that renders them highly practical, the rightmost one overlapping a pink edged circle of scotchlite reflection. these seem to appear in the oddest places on a number of the paul smith collaborations, not entirely attractively if i'm allowed to say so. their functionality is not under scrutiny, but their elegance definitely is. the weather might not quite have reached the seasonal point at which this windproof shirt can be left blowing in the wind, impressing innocent bystanders with designer couture. at least, it certainly hasn't in the hebrides. but come the end of may, when one is yet again forced to pedal around the island's distilleries, feigning interest in the process of making whisky for the eleventh year in succession, an off-white shirt casually thrown over a merino tee will give me that insouciant quality that decries any level of geekness associated with the amber nectar. 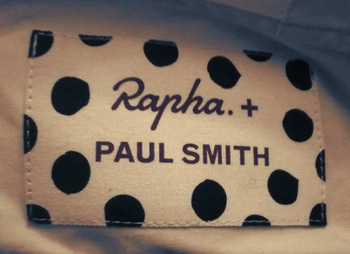 and if any look more closely than they really should, the rapha + paul smith polka dot label will confirm whatever they thought in the first place. £130 may be considered a hefty price to pay for even a paul smith associated shirt, but think of it more as a windjacket with buckets of style, and a domestic versatility that its stuffed in a rear pocket sibling can only tilt as at windmills. the rapha + paul smith windshirt can be acquired in sizes small (reviewed) to xxl in either purple or off-white direct from rapha.cc at a cost of £130.